Even when the real estate market in most parts of the country remained sluggish over the last few years, property investors can buy a property in Hyderabad for handsome benefits. The Telangana government’s positive outlook in terms of aggressive infrastructure development, including elevated corridors, strategic road networks, and the Metro Rail, are prime factors that have helped Hyderabad keep up a sustained growth rate. Steeped in rich heritage, culture, and architectural beauty, the Pearl City of India has been consistently topping high-liveability charts, with its first-rate amenities and ample employment opportunities. Hyderabad is also one of the fastest-growing IT and ITES hubs in the country, housing top Fortune-500 companies, which has also fuelled the real estate growth in and around the city. Overall, the city has been making both consumers and investors happy. That said, armed with our data from the last six months, let us throw our spotlight on some latest trends and locations that are currently facing high demands among home buyers and investors, and the top locations where you can buy a property in Hyderabad. 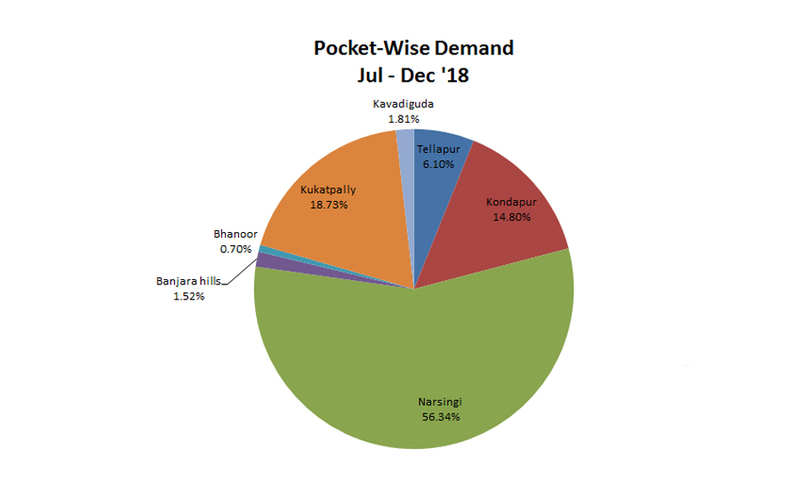 Housing hotspots – With Narsingi, Kukatpally, and Kondapur pockets attracting maximum buyer enquiries during the last six months Jul-Dec 2018, these three suburbs top our list of locations currently in demand. The south-western suburb of Narsingi and its adjoining areas witnessed 56.34% of enquiries, while the percentage of enquiries for the pockets of Kukatpally and Kondapur were found to be 18.73% and 14.80% respectively. Currently, if you want to buy a property in Hyderabad, you must look at these locations. Because the Narsingi area has an added advantage of being one of the major junctions of the Outer Ring Road (ORR), it is an ideal location for living as well as has IT hubs located in the Financial District, Gachibowli and HITEC City within a 25-km radius. The pocket houses some of the largest budget housing projects while more residential development is taking place. These factors have made Narsingi one of the most sought-after residential addresses for home buyers (especially IT professionals) in the city. 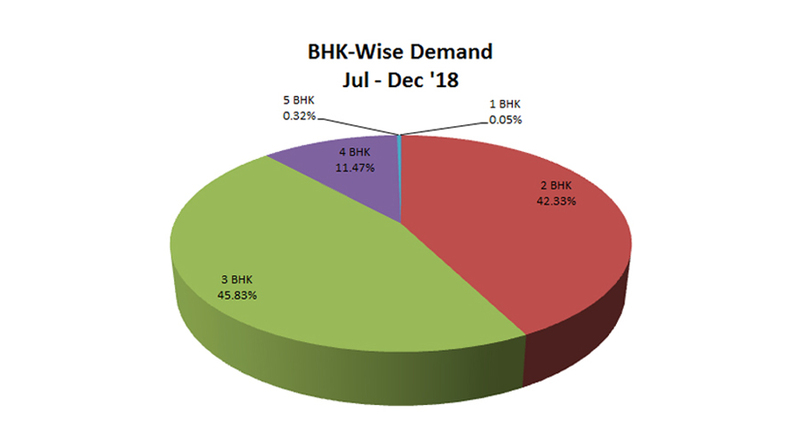 3 BHK in high demand – When it comes to BHK-wise demand, the 3 BHK category has received the maximum percentage of enquiries (45.83%) compared to 2 BHK (42.33%) and 4 BHK (11.47%) categories. Demand for upper-mid-level projects on the rise – Our data shows that out of the total buyer enquiries in Hyderabad, properties within 71-80 lacs price bracket attracted the highest percentage of enquiries (20.39%). 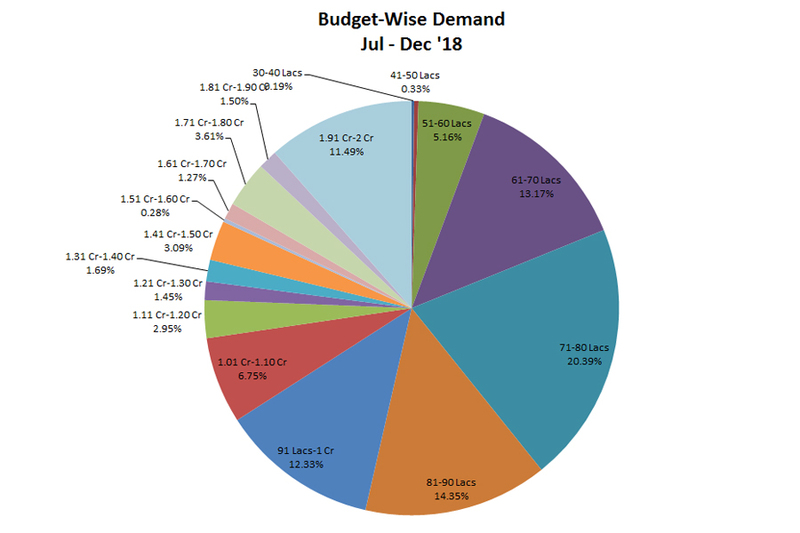 Second in demand are projects that fall within the price range of 81-90 lacs (14.35%), while projects under 61-70 Lacs price range are the third most enquired category at 13.17%. Interestingly, projects within 30-40 lacs price bracket received the least attention from potential buyers (0.19%) but those within 1.91 Cr-2 Cr price range witnessed 11.49% of buyer enquiries. Now that we have seen some of the current trends, let’s take a look at some upcoming locations with the most promising future prospects. Located in one of the prime localities in Hyderabad, Rajendra Nagar has seen a significant uptrend in the demand for residential spaces over the past few years, driven by factors like advancements in transportation and connectivity, excellent security facilities, and superior infrastructure, to name a few. The locality offers a high-quality lifestyle to its residents, thanks to first-rate public amenities, educational institutions, healthcare organizations, shopping malls, and entertainment hotspots. The Secunderabad railway station is 21 kilometres from Rajendra Nagar, while the Rajiv Gandhi International Airport is just 19.9 kilometres away. Some of the well-known educational institutions and healthcare facilities in Rajendra Nagar are Holy Mary School, Queens International School, Kasturba Nature Cure Hospital, and Usha Mohan Hospital. Prominent restaurants and shopping malls in the locality include Tanmai Hotel, AKR Restaurant, Inorbit Mall, and South India Shopping Mall. Well-connected with business districts like Hitech City, Begumpet, and Banjara Hills, Rajendra Nagar promises a tremendous growth opportunity for investors, as property prices in this locality are still affordable. Nacharam, an upscale neighbourhood of Hyderabad, is being hailed as a high-return investment zone for its world-class infrastructure, including schools, hospitals, shopping malls, banks, and hotels. At a distance of 60 km from Hyderabad, the location, urbanizing at a rapid pace, is emerging as a top go-to destination for real estate investors because of the wide range of low-priced options that this area offers. From villas to bungalows, ready-to-move apartments, and under-construction projects, the property variety to choose from is extensive, with respect to shape and price. These residential properties, with a price tag between Rs 30 lakh and Rs 50 lakh, will give a good return on investments in the mid-to-long run. Dubbed as Hyderabad’s real estate gem, Kompally, on the outskirts of the city, is fast transforming from a suburban district to a thriving educational, residential, and industrial centre. Once famed for its farmhouses and grape vineyards, Kompally still retains its green ambience despite transforming into a world-class residential hub housing some of the best gated communities in Hyderabad. The locale shares close proximity with the ORR (Outer Ring Road) and the Begumpet Railway Station. The nearest Metro Railway station is Miyapur, distanced 23 kilometres from Kompally along the Mumbai Highway. There are a number of big-ticket social infrastructure in the vicinity, including renowned schools, reputed colleges, famed hospitals, premium shopping centres, restaurants, and parks. Some of the famous educational institutions in the area are Neeraj Public School, Unicent School, DRS International School, St. Martin’s Engineering College, Siva Sivani Institute of Management, and Malla Reddy Engineering College. Prominent hospitals in the locality include Balaji Hospital, Sri Sigma Hospital, and Swarupa Multi Speciality Hospital. At present an affordable investment, Kompally has high growth potential for housing because of the consistent expansion of major social and connectivity infrastructure. The location’s seamless access to IT hubs like Mahindra Tech Park and HITEC City is an added advantage. A wide variety of proposed projects in different formats are attracting momentous investor’s attention to this western part of Hyderabad. Shankarpalli, considered a green belt of Hyderabad, is 6 km from Mokila, and 11 km from the city’s financial district, HITEC City. The site, sitting on high-grade infrastructure, is home to good educational institutions, healthcare facilities, resorts, and recreational sectors. Prominent schools and colleges in the area include Indus International School, ZP High School, Global Indian International School, St. George College of Education, and IIT Hyderabad, which is 5 km away. Being close to Cyberabad, and easily accessible from all major districts of Hyderabad, Shankarpally is one of the risk-free areas that offers a lucrative proposition for residential investments. The 100-feet-wide proposed 4 lane highway will add incredible value, further enhancing the growth potential of the locality. Touted as the next IT hub of Hyderabad, Adibatla, in the Ranga Reddy district of Telangana, is a part of the Information Technology Investment Region (ITIR), where IT spaces, Special Economic Zones (SEZs), and industrial parks are proposed. 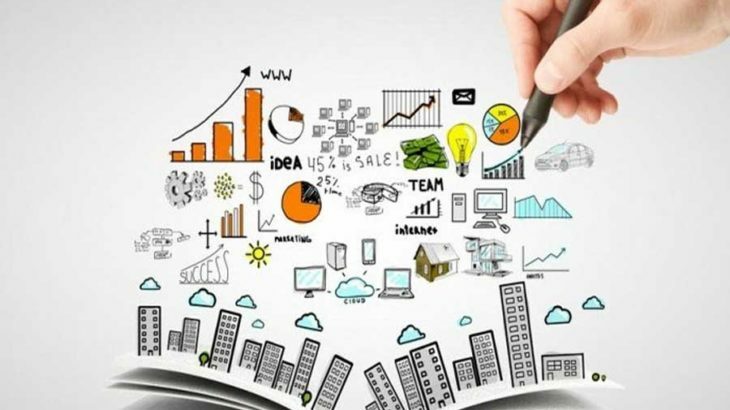 The region is, therefore, drawing massive attention from individual investors, IT and ITES organizations, as well as companies from various other sectors. Posh residential areas like Nadergul, LB Nagar, Maheshwaram, Bongloor, Balapur, Auto Nagar, Shashabad, Ibrahimpatnam, Vanasthalipuram, and Saroor Nagar, encompass the fast-developing locality, which is only 22 km from Hyderabad via the Badangpet Road. Adibatla presents varied residential configurations, mainly in two price brackets — up to Rs 20 lakh and Rs 40 lakh to 60 lakh. The above-mentioned zones, developing at a speedy pace on the outskirts of Hyderabad, are being seen as lucrative property markets in the making. Consistently developing connectivity and the influx of MNCs and corporates will further heighten the appeal of these localities as top investment destinations in years to come. For those wanting to buy a property in Hyderabad and reap the benefit of the highly rewarding real estate market, these are some of the best locations to consider. Can you suggest a commercial or residential plot in 20 lakhs range, which have scope to develop in next 5 years. Thank you for reaching us. Please share your mobile number to understand your requirement better. Home Buyers are Now Financial Creditors: What is the Difference?